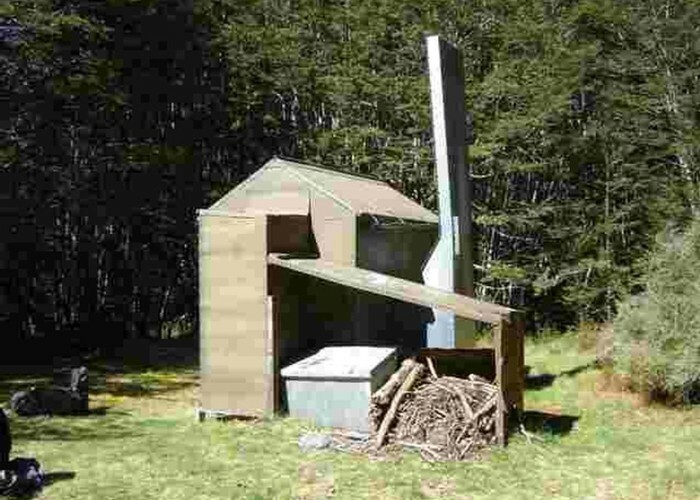 Mansion Hut is a typical Eyre Mountains hut: 2 bunks, a table and a fireplace in an old forestry-style hut. Fireplace large enough to roast a whole deer (not that I've seen any), doesn't draw unless the door's open (or your tape newspaper across at least half of the fireplace), lets in the gale and lets out the heat. But it's home, and it's one of my favourite evening tramps. An easy 1.5 to 3 hour walk in from the roadend, on a good track, easily possible at night, though the creek crossing can be tricky to find the 1st time. On a clearing by the creek, on the bushedge, so plenty of water and firewood. Eels in the creek, but not seen any good fish yet! Good route up the spur after the next sidecreek leads to the ridge-line track between Irthing Biv and Mt Pen huts. Old track along the river to Irthing Biv is overgrown and harder than the ridge. Mansion hut • By cluanbeag. Licence: C.
Added 15 February 2007 by madpommadpom. 1 revision 4 August 2018 by HonoraHonora.